Here are The NRL Tweet's Previews & Tips for Round 25 of the 2010 NRL Premiership. Round 25 of the NRL presents tipsters around the nation with one of two options - go for the glory and try to narrow the gap on the leaders or pick the safe option and go with the favourites. There is another option that we've been employing all season long, which in Round 25 actually channels the latter. At wdnicolson.blogspot.com we have been doing our best to tip the winners of each game each week - on a Tuesday - and rather impressively we have actually delivered at a 64% success rate in 2010. While we have been tempted to change a boatload of tips during the latter half of the week when injuries become clearer, the format of sticking to what we feel like is the right choice on the Tuesday has worked so far - so we're sticking to it. 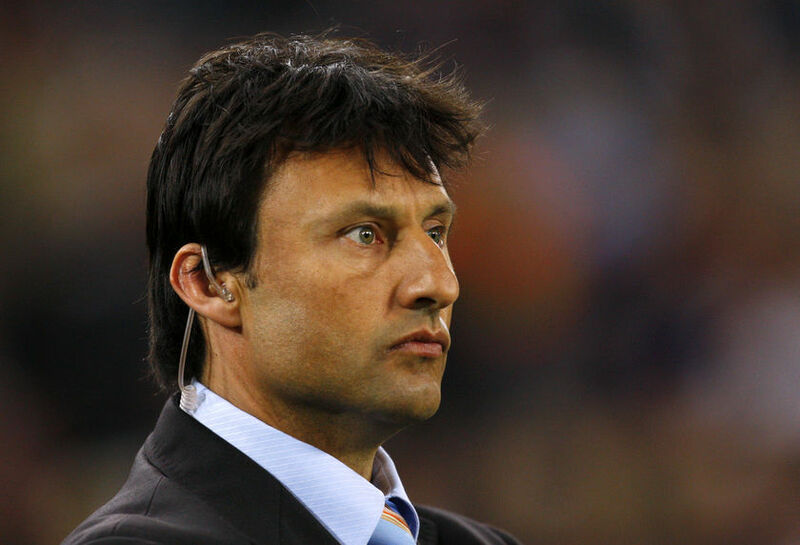 Even if it means we're tipping the same as the great Laurie Daley this weekend. Apologies in advance if it turns out terribly for one and all. Speaking of Tips for Big Games - the American Rugby League Grand Final will be played in Philadelphia this Saturday with the Jacksonville Axemen taking on the New Haven Warriors. Kick-Off is 5am Sunday Morning AEST - get more info here. Going with the Axemen in the decider! As we enter Round 25 of the 2010 Premiership - we are still stuck with 12 teams in the running for 8 playoff spots, this will change however with the Eels, Rabbitohs & Knights all needing to win to stay alive for another week. |=| ROUND 25 EXPERT TIPS FROM A 4 YEAR OLD + In studio this week you'll find Waz & Dave as they spend way too much time breaking down your team's chances at not only the Top 8 but the Premiership as well + Waz & Dave are joined by QLD's 101.5FM Breakfast Presenter Matt Duncan to get an update on Darren Lockyer and explore the chances of a second Brisbane Team working + Nic gets on the phone with Waz & Dave to take us through the Round 25 Preview and discuss why he owes Waz a lifetime supply of Special Fried Rice + NRL Tweet Player of the Year Update + Signing News: Frank Pritchard signs with Bulldogs & Manu Vatuvei re-signs with Warriors + Who won't be back in 2010 for your team's playoff assault? + We ask what are the selection decisions by coaches that make absolutely no sense to you? Voting went into secrecy at the completion of Round 20 of the Premiership - check out The NRL Tweet for updates on who made a move from Round 21 to 26. |=| FRIDAY - This game Starts at 6:05pm AEST - Don't forget! |=| 7th Warriors: 12-10, 477-470, +3, 28pts. |=| 8th Brisbane Broncos: 11-11, 488-481, +7, 26pts. |=| Wednesday's Preview: If the Warriors win this they not only claim a Top 8 spot but can put enormous pressure on the Broncos to keep their playoff streak alive. Given the game is in Auckland and the track will be likely slick as per usual - go with the home team to nullify the Broncos best... that is their best without Darren Lockyer. Warriors to win here off the back of their defence. Full Preview in the NOT The Footy Show Podcast out Thursday August 26 on iTunes. |=| Team Selection + Fantasy News August 24 (Friday's Update with help from SMH's Late Mail): No Darren Lockyer for the Broncos is the biggest story. Corey Norman is listed at five-eighth again but don't be surprised if he comes off the bench or possibly misses out entirely to allow Nick Kenny to play. One re-shuffle could see Alex Glenn moving from the centres with Matt Gillett going there and Ben Te'o playing in the backrow. Glenn will either shift to the wing with Antonio Winterstein missing out - or perhaps you'll see Glenn or Ben Hunt at five-eighth. The Warriors lost Micheal Luck to a gash in his leg but get Kevin Locke back on the wing. Jacob Lillyman or Ukuma Ta'ai will start for Luck. Jerome Ropati may be a late addition for Joel Moon in the centres. Update August 27: Ivan Henjak believes Corey Norman is up to the challenge in the press today - so expect Norman to play. Warriors will omit one of Jesse Royal or Sione Lousi from their bench. |=| NRL Tweet's Prediction: WARRIORS by 7 = ? |=| 10th South Sydney Rabbitohs: 10-12, 536-513, +23, 24pts. |=| 12th Parramatta Eels: 10-12, 385-441, -56, 24pts. |=| Wednesday's Preview: South Sydney have the best differential of the chasing teams for a Top 8 berth but they have the toughest draw. Without John Sutton it doesn't look like Chris Sandow has the skills to carry the attack by himself... Jarryd Hayne on the other hand certainly does and he should be key to the Eels winning. Parramatta to claim the two points at ANZ and stay alive in the Top 8 race... at least mathematically. |=| Team Selection + Fantasy News August 24 (Friday's Update with help from SMH's Late Mail): South Sydney lost Beau Champion to a broken leg so Dylan Farrell starts. Jason Clark is picked at lock with Michael Crocker moving to the second row and Sam Burgess is back at prop where he has been really strong before his suspension. Dave Taylor also comes in but the South Sydney injury list remains way too long. Parramatta get Ben Smith back from suspension and Daniel Mortimer comes in for the injured Jeff Robson in the halves. Update August 27: Both teams look to be right for this one. Timana Tahu's ankle is still a concern but Jonathan Wright is unlikely to be needed. |=| NRL Tweet's Prediction: EELS by 4 = ? |=| 14th Cronulla-Sutherland Sharks: 6-16, 312-543, -231, 16pts. |=| 2nd Gold Coast Titans: 14-8, 483-450, +33, 32pts. |=| Wednesday's Preview: With Preston Campbell & Anthony Laffranchi withdrawals late in the week - the Titans look a little vulnerable here with a visit to Shark Park. But there's the rub - they are playing Cronulla. Pick the Titans because you can't afford to get stung by relying on the Sharks to win 2 games in 3 weeks. |=| Team Selection + Fantasy News August 24 (Friday's Update with help from SMH's Late Mail): Cronulla bring in Ben Pomeroy for rookie Ricky Leutele in the centres. Preston Campbell has been named to return from a hamstring injury at the expense of Jordan Atkins. Mat Rogers should play despite being poked in the eye against the Roosters. Update August 27: Campbell & Laffranchi are out with Jordan Atkins in for Campbell and either Sam Tagataese or Luke O'Dwyer coming in for Laffranchi. No changes at this stage for the Sharks. |=| NRL Tweet's Prediction: TITANS by 10 = ? |=| 9th Canberra Raiders: 11-11, 433-473, -40, 26pts. |=| 15th North Queensland Cowboys: 5-17, 413-601, -188, 14pts. |=| Wednesday's Preview: If Canberra lose this game it will be their worse loss since Jason Bulgarelli dropped the ball over the line in the dying minutes of a semi final against the Warriors in 2003. If the Raiders are fair dinkum about making the Finals in 2010 - they have to beat the woeful Cowboys by plenty in the final home game of the season and Alan Tongue's 200th First Grade Game. Canberra just cannot afford to lose this game... so you have to pick them. |=| Team Selection + Fantasy News August 24 (Friday's Update with help from SMH's Late Mail): Canberra named the same 17 that beat the Dragons plus Danny Galea & Troy Thompson. Trevor Thurling is in some doubt with a shoulder injury. North Queensland bring in Michael Bani for Willie Tonga who is out for the year, while Clint Amos and James Tamou come onto the bench for Isaak Ah Mau & Jason Taumalolo. Update August 27: Thurling is struggling so Shaun Fensom would start at lock and Troy Thompson seems likely to get a farewell game in front of the Canberra faithful. Arana Taumata is in line to come into the Cowboys side for Grant Rovelli in the halves. |=| NRL Tweet's Prediction: RAIDERS by 20 = ? |=| 11th Newcastle Knights: 10-12, 477-509, -32, 24pts. |=| 1st St.George-Illawarra Dragons: 15-7, 454-257, +197, 34pts. |=| Wednesday's Preview: Newcastle have to win to stay alive in the Top 8 race but if the Dragons slip up here - they could surrender the Minor Premiership. It is the Old Boys Game for the Knights but the Dragons will turn up to play here and the Knights are just too inconsistent to pick. Stick with the Dragons to clinch the Minor Premiership and end Newcastle's season. |=| Team Selection + Fantasy News August 24 (Friday's Update with help from SMH's Late Mail): Knights keep the same 17 that beat the Broncos last Friday Night. St.George-Illawarra recall Beau Scott & Jeremy Smith who were rested against Canberra. Update August 27: Shannon McDonnell is in serious doubt with a hamstring injury - Wes Naiqama would come into the starting team, with Joel Edwards a chance to join the bench. The Dragons will leave two of Nick Emmett, Luke Priddis & Jarrod Saffy off their bench. |=| 3rd Wests Tigers: 14-8, 493-468, +25, 32pts. |=| 16th Melbourne Storm: 13-9, 441-333, +108, 0pts. |=| Wednesday's Preview: The scenario entering this game is simple - if the Wests Tigers win they can put themselves in a position to grab 2nd spot. If the Storm win they will stay in last. Talk about a motivation disparity. As a result pick the Tigers at Leichhardt Oval on a Sunday afternoon, especially given the Storm may rest some key players. Tigers simply have too much to gain with a win here and the Storm gain absolutely nothing from it. |=| Team Selection + Fantasy News August 24 (Friday's Update with help from SMH's Late Mail): Wests Tigers have named Wade McKinnon at fullback after he recovered from a hamstring injury. Mitch Brown goes back to the bench and Geoff Daniela misses out. Melbourne have added Jesse Bromwich & Brett Finch to the team that beat the Sharks - with Sione Kite & Luke Kelly making way. Sika Manu is named in the centres. Update August 27: The Tigers should be as per Tuesday. The Storm may not have Brett Finch again with Gareth Widdop or Luke Kelly coming in and also Billy Slater who may stay in Melbourne to be with his new born baby (son Jake). Todd Lowrie & Greg Inglis have been battling the flu but should play. |=| NRL Tweet's Prediction: TIGERS by 8 = ? |=| 6th Sydney Roosters: 12-10, 511-488, +23, 28pts. |=| 5th Manly-Warringah Sea Eagles: 12-10, 507-450, +57, 28pts. |=| Wednesday's Preview: Big Game as the winner stays in the hunt for a Top 4 berth while the loser could drop into 'must win' territory just to make the Top 8 in Round 26. The latter scenario seems more likely for the Roosters with a loss here because their differential of +23 is not as good as Manly's +57. But both teams should win one of their final two games and given this is at the SFS and the Chooks look healthier than the Sea Eagles - go with the Roosters. Todd Carney had half a dozen errors in last week's loss - he could have half a dozen tries against Manly if he clicks - go with The Todd & The Roosters. |=| Team Selection + Fantasy News August 24 (Friday's Update with help from SMH's Late Mail): The Roosters added Lopini Paea to the bench as cover for Mose Masoe who has a neck injury. Manly lost Shane Rodney for the season to an ACL and named Chris Bailey to start in his place. Jamie Buhrer comes onto the bench for Manly. Anthony Watmough is in doubt with a leg injury. Update August 27: Watmough is still in doubt as is Masoe. Manly may yet get Ben Farrar or William Hopoate back for this game. Josh Perry looks to be another week away at least. |=| NRL Tweet's Prediction: ROOSTERS by 12 = ? |=| 13th Canterbury-Bankstown Bulldogs: 8-14, 446-491, -45, 20pts. |=| 4th Penrith Panthers: 13-9, 571-459, +112, 30pts. |=| Recent Clashes: To Come. |=| Wednesday's Preview: Penrith have to win this game to keep their Home Final spot secure and it is hard to see Canterbury putting up a fight given their efforts the last few weeks. Despite the Dogs pulling off a miracle against the Cowboys 22-20, the Panthers just came off crushing the Rabbitohs 54-18 - and the Panthers should be too good at ANZ Stadium despite Canterbury farewelling Luke Patten & Brett Kimmorley in their final home game. Penrith will win - the question is by how much. |=| Team Selection + Fantasy News August 24 (Friday's Update with help from SMH's Late Mail): Canterbury have lost David Stagg for the rest of the year with a shoulder reconstruction. Dene Halatau is also out with a knee injury and Daniel Rauicava has been dropped. Gary Warburton starts at lock, Jamal Idris goes back to the centres and Blake Green & Ben Hannant coming onto the bench. Penrith recall Gavin Cooper on their bench with Daine Laurie no certainty with a wrist injury. Michael Jennings will play despite a shoulder injury. There is no Lachlan Coote at fullback. Update August 27: Michael Jennings remains in doubt but the Monday Night game should allow him to recover. The Dogs may have lost Michael Hodgson to a hamstring injury with Martin Taupau a chance of making just his 2nd appearance of the season from the Toyota Cup. |=| NRL Tweet's Prediction: PANTHERS by 10 = ? |=| Round by Round: 5/8 - 6/8 - 7/8 - 6/8 - 5/8 - 5/8 - 5/8 - 6/8 - 1/4 - 6/8 - 3/5 - 5/7 - 5/8 - 2/5 - 4/7 - 2/8 - 3/5 - 3/7 - 7/8 - 5/8 - 5/8 - 4/8 - 6/8 - 6/8. |=| NRL Tweet Player of the Year Award - Round 24 Voting Complete.